Poor Ev, she wakes up in Vegas with her head in the toilet bowl. A hot man is in her hotel room and she cannot remember why. Here she is hoping she did not embarrass her self with him and she learns she married him. Her lack of memory doesn't inspire happy thoughts for David. Things don't get better for a little bit but thankfully for us readers they do get their ducks in a row. Obviously something struck Ev about David that she married him. Might be a good idea to see if she can find it again. Emotionally, this book digs into your gut. Kylie likes to make you feel. David and Ev have great dialogue. David and Ev's spontaneous relationship means there are ties in the past that need to be taken care off. Ev has her family to deal with and David has some hang ups over an ex who isn't as far in the background as Ev believes she is. They do have an instant chemistry but it is easy. Nothing worth having ever is. You have to work for what you really want to get it. You have to work to keep it. 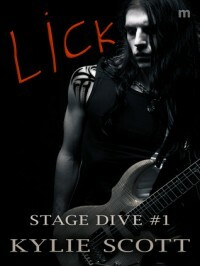 Lick is the first in what I hope will be several books featuring the Stage Dive men.